My recent article on why mirrorless cameras are needed provoked a few emails I need to respond to, and in addition to doing so privately I thought it worthwhile to add a couple of thoughts to my previous article. In particular, a number of folk wanted to add two things to my arguments as to why mirrorless cameras are attracting users. Those are: (1) sensor-based IS; and (2) silent shutters. I’ll admit I’m a bit apathetic when it comes to IS. My belief is that stabilization should be turned off unless there’s something that absolutely dictates that it be turned on. This is not what most consumers do. Instead, they tend to rely upon the crutch of IS so that they can shoot more casually and without a lot of shot discipline. IS is not a wonder drug. It doesn’t cure the disease, it masks the symptoms. That appears to be enough for many to gravitate to it. What does this have to do with mirrorless systems? Well, the argument coming into my In Box is that only mirrorless systems have sensor-based IS. That’s not true. Recent Pentax DSLRs have sensor-based IS, so you can’t make the claim that this is a “mirrorless advantage.” That Canon and Nikon have not built DSLRs with sensor-based IS to date doesn’t mean that DSLRs can’t add this, as Pentax has shown. If sensor-based IS were the real reason people were buying mirrorless cameras, we would have seen a significant shift towards Pentax in the DSLR world, and we haven’t. Indeed, if it were the real reason why mirrorless cameras were being bought, Canon and Nikon would simply come up with their DSLR implementations. Silent shutter is more a valid argument for mirrorless, but ultimately could fail for similar reasons. Some DSLRs now have incredibly quiet Live View modes, and they could move to electronic shutters and become completely quiet, too. That said, it’s simple to implement electronic shutters on mirrorless cameras because the shutter is by default open all the time, so quite a few mirrorless makers have added this function if the sensor they use supports it, including Nikon. As I noted with real-time histograms, the DSLR duopoly has not given us features that they could provide, but the mirrorless makers have gone ahead and implemented them. The real question I’m trying to answer is what has provoked the fact that a little over a quarter of ILC sales are now mirrorless. For the most part, I’ll stick with my answer, though the two things mentioned above are add-ons that re-inforce the rest of the points I made. Simply put, the mirrorless camera designers had to be more creative and proactive in order to win any support at all. We’re now in a very strange place where a DSLR with more image quality and many more traditional features sells for less than a mirrorless camera with less image quality, but is smaller and lighter and has a number of newer features. In particular, it’s the crop sensor DSLRs that are most impacted by mirrorless. Some might argue that the Sony A7 models impacted full frame DSLRs in some way, but frankly, the numbers don’t seem to reflect this much. To a large degree, the A7 models basically just sucked up the old Sony Alpha DSLR market share. Smaller and lighter. 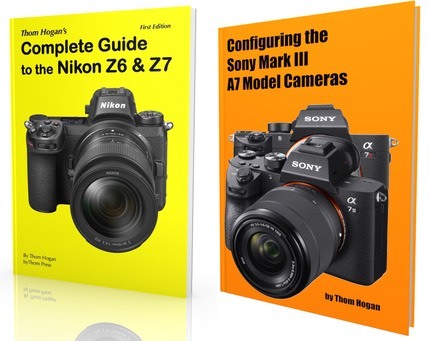 This really shows up with the m4/3 and the Sony A6xxx models. Far less so with the A7 models once the user discovers how big the best lenses are for it. Full lens sets. This is particularly an m4/3 strength, but Fujifilm is not far behind considering that they’re a sole practitioner against multiple ones. Sony would be wise to fix the E lens set, stat. What you see is what you (might) get. The EVF brings feedback to the real time level compared to DSLRs. This was the primary focus of my previous article. Feature pioneering. This is where sensor-based IS and silent shutters get added to the list of things like real-time histograms. But note the word “pioneer.” That’s because many of the things that fit into this category are not restricted to mirrorless; they could be applied to DSLRs designs, too (as could the first two bullets, above). As tends to always happen in mature markets, the -opolists—in this case Canon and Nikon—get lazy and are slow to make changes that would preclude competitors from carving out niches around the main market. The good news is that gave us a lot of very interesting products that have unique abilities and traits (mirrorless cameras). The bad news is that at some point Canon and Nikon wake up and simply move in and suppress the competitors’ success by implementing the same things. To some degree, Canon is already on the move. The EOS M5 shows that they’re beginning to implement some of the above things. I don’t think they understand why the various mirrorless makers have carved out small slices of the ILC market, though. Canon seems not likely to build a full lens set, nor is it moving very fast towards implementing pioneering features. Nikon, on the other hand, came in blazing to the mirrorless market, but with a very small, very expensive gun (and you could get a pink one!). Now they’re out of the market licking their wounds. How they come back will be interesting to watch (and like Arnold Swarzenegger, they will be back).